Cancer vaccines are designed to turn the body’s own immune system specifically against tumor cells. Particularly promising are vaccines that are directed against so-called neoantigens: These are proteins that have undergone a genetic mutation in tumor cells and, therefore, differ from their counterparts in healthy cells. The tiny alteration – sometimes only a single protein building block has been changed – gives the protein on the tumor cell surface novel immunological characteristics that can be recognized as “foreign” by the immune system’s T cells. Therapeutic vaccines using a short protein fragment, or peptide, specifically containing the mutated site can then direct immune cells specifically to the tumor. “However, a basic prerequisite for the effectiveness of a vaccine of this type is that the vaccine peptide is presented to the immune cells on the surface of the tumor, and it must be tailored to a shape that matches exactly. Our new test can detect whether this is the case,” says Professor Michael Platten, who heads a department at the German Cancer Research Center (Deutsches Krebsforschungszentrum, DKFZ) and also works as a senior consultant in the Department of Neurology at Heidelberg University Hospital. 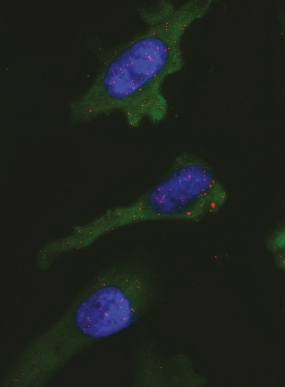 Even if cancer-specific neoantigens are present in tumor cells, this does not necessarily mean that they can be presented by the MHC molecules. Michael Platten, who is himself working on a tumor vaccine, has therefore been searching for a method to test, in tumor biopsies, whether or not MHC molecules display the neoantigen on the tumor cell surface. Platten and his colleagues have now described a clever solution to this problem: The PLA test* is based on the use of two antibodies, one that recognizes the neoantigen, and another that recognizes the MHC molecule. Only if the target structures of both antibodies are located in immediate proximity to each other will specific molecular-biological reactions produce a light signal. The investigators have now demonstrated the effectiveness of the new test by using a tumor neoantigen found in brain cancer as an example. More than 70 percent of the time, specific brain tumors known as low-grade gliomas exhibit an identical “typo” in their DNA. As a result, a single, specific protein building block in an enzyme called isocitrate dehydrogenase 1 (IDH-1) is exchanged at the 132nd position in the protein’s sequence. Michael Platten and his colleagues recently demonstrated that the mutated IDH-1 peptide induces specific immune responses against brain tumors. Now they plan to launch a clinical Phase I trial with the goal of evaluating the safety of the peptide vaccine against IDH-1-mutated glioma. Caption: A cancer cell displaying tumor antigens at its surface. The red dots indicate where MCH molecules and tumor antigen co-locate.